Tying together the annual Bowman prospect franchise with a focus on the 2018 MLB draftees, 2018 Bowman Draft Baseball stays with the jumbo formats of recent years. Collectors can find Hobby Jumbo boxes with three autographs or Hobby Super Jumbo with five autographs. 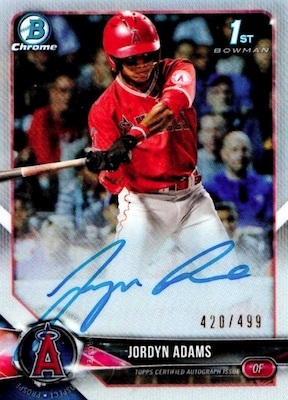 While the lineup features the first cards for many new prospects, most of the designs and parallels carry over from 2018 Bowman Chrome. 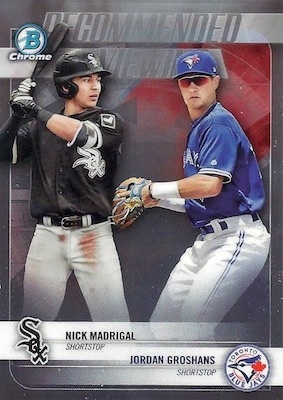 Relying heavily on the new influx of MLB talent, the 2018 Bowman Draft Baseball checklist features a 200-card base set with both Paper and Chrome Refractor parallels. The breakdown follows and you will note that a few options are exclusive to the main Hobby Jumbo format and are not found in Super Jumbo. There is also the region-specific Asia format with 12 exclusive Asia Refractor parallels per box. Becoming a new trend for Bowman sets, there are also limited image Variations for some of the key subjects in the base set. As for the 2018 Bowman Draft Baseball inserts, there is a throwback option via 1998 Bowman 20th Anniversary with current players on the previous design. Another choice is the Bowman Sterling Continuity insert with base, Atomic Refractor (#/150), Orange Refractor (#/25; Jumbo only), Red Refractor (#/5) and SuperFractor (1/1) versions. In addition, Franchise Futures pairs 2018 draft picks from the same franchise, while Recommended Viewing highlights an appealing prospect duo. These two multi-player card sets, along with the 1998 insert, offer Refractor (#/250), Gold Refractor (#/50), Red Refractor (#/5) and SuperFractor (1/1) parallels. 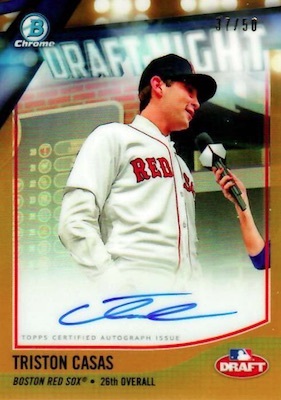 The belle of the ball, the on-card Chrome Draft Pick Autographs line is where the bulk of the action takes place in 2018 Bowman Draft Baseball. Some of the top-overall picks are also treated to a rainbow of colorful Refractor parallels. Other signed choices include Class of 2018 Autographs (case hit; #/250) for top picks, Draft Night Autographs (#/99) with images from the event, and Recommended Viewing Dual Autographs (#/99). All three have Gold Refractor (#/50), Red Refractor (#/5) and SuperFractor (1/1) parallels. More base inserts have autographed editions, as well, including Bowman Sterling Continuity Autographs (#/99) and 1998 Bowman 20th Anniversary Autographs (#/99). Both offer Red Refractor (#/5) and SuperFractor (1/1) parallels, while Sterling has the Jumbo-exclusive Orange Refractor (#/25). Finally, the base variation cards have a signed version, limited to 99 copies. 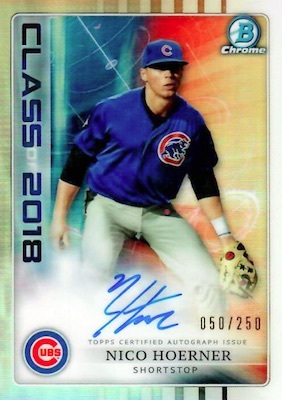 Adding a little more to 2018 Bowman Draft Baseball, incremental hits include Under Armour Game Autographs (#/199) for past high school stars. 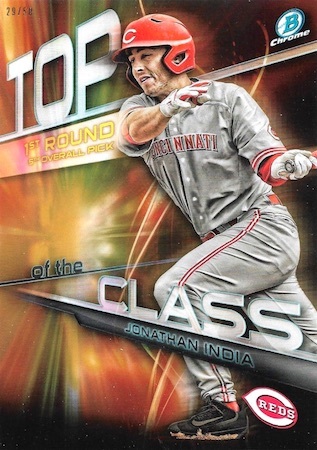 Exclusive to Hobby Jumbo, the Top of the Class box toppers are numbered to 99. These oversized Chrome cards also come as Gold Refractor (#/50), Red Refractor (#/5) and SuperFractor (1/1), and Autograph (#/35) parallels. Buy 2018 Bowman Draft boxes direct from Topps for $155.99. 200 cards. Buy complete base sets on eBay. PARALLEL CARDS: Sky Blue #/499, Purple #/250, Blue #/150, Green #/99, Gold #/50, Orange #/25 (Jumbo), Red #/5, Black 1/1, Printing Plates 1/1. REFRACTOR PARALLELS: Refractor, Asia Refractor, Sky Blue #/402 (Jumbo), Purple #/250, Sparkles, Blue #/150, Green #/99, Gold #/50, Orange #/25 (Jumbo), Red #/5, SuperFractor 1/1, Printing Plates 1/1. 14 cards. Full guide and gallery. 7 cards. Serial numbered #/99. Buy 2018 Bowman Draft MLB autographs on eBay. REFRACTOR PARALLELS: Refractor #/499, Purple #/250, Blue #/150, Blue Wave #/150, Green #/99, Black #/75 (Jumbo), Sparkles #/71, Gold #/50, Gold Wave #/50, Orange #/25 (Jumbo), Red #/5, Red Wave #/5, Black Wave 1/1, SuperFractor 1/1, Printing Plates 1/1. REFRACTOR PARALLELS: Red #/5, SuperFractor 1/1. 9 cards. Serial numbered #/99. REFRACTOR PARALLELS: Orange #/25 (Jumbo), Red #/5, SuperFractor 1/1. 30 cards. Serial numbered #/250. 1 per case. REFRACTOR PARALLELS: Gold #/50, Red #/5, SuperFractor 1/1. 4 cards. Serial numbered #/99. 11 cards. Serial numbered #/99. 5 cards. Serial numbered #/199. REFRACTOR PARALLELS: Refractor #/250, Gold #/50, Red #/5, SuperFractor 1/1. REFRACTOR PARALLELS: Atomic #/150, Orange #/25 (Jumbo), Red #/5, SuperFractor 1/1. 12 cards. Serial numbered #/99. Jumbo only. 11 cards. Serial numbered #/35. Jumbo only. View the full 2018 Bowman Draft Baseball checklist spreadsheet. I really used to enjoy cracking Bowman Draft, but with the larger pack format at a much higher price per pack it almost prices me out, kinda of a bummer…. Overall this appears to be a good draft class, especially for hitters and a few prized pitchers. The two best hitters look like they’ll be put into 2019 bowman (Beer/Bart). Was really excited for this product, but now a little tempered. 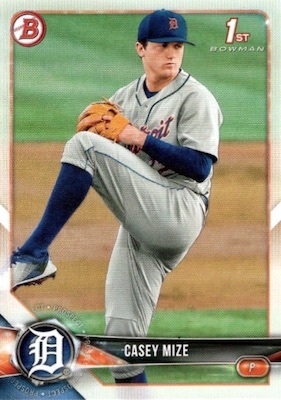 Bowman and Topps have done a horrible job with the prospects they select for the cards. 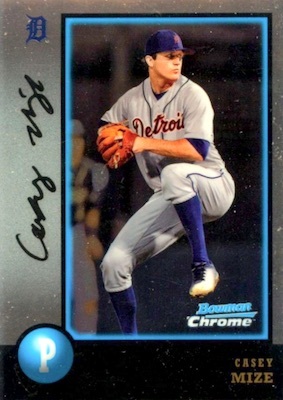 Topps has 3 products that highlight prospects: Bowman, Topps Pro Debut and Bowman Draft. As a Braves fan, with the vast number of prospects they have had the last few year, I have been underwhelmed with their choices. The same players are selected over and over. 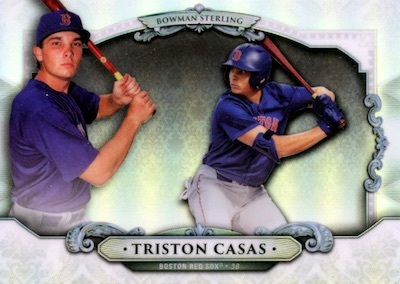 The last few years the Topps Pro Debut set was almost identical to the Bowman set that proceeded it. I didn’t even feel it was worth buying the Pro Debut set because I felt like I already owned it after purchasing the Bowman set. The Bowman draft set has went backwards over the years. It seemed like there used to be about 6-8 draft picks per team. It has been scaled back quite a bit. This years set only has 1 player drafted by the Braves. The Braves did lose a few early picks, but still drafted several players that were ranked in the top 150 by several publications and also drafted a few under the radar guys. The only other Braves players available in this set are two of the same players that have been picked over and over again for Topps other sets. 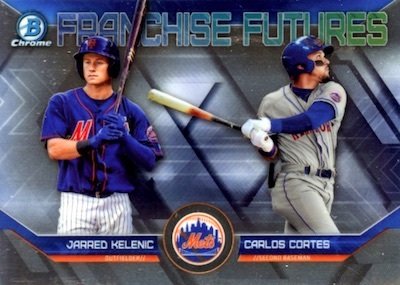 Hopefully Topps starts diversifying the players it chooses for its sets soon because I’m disappointed and losing interest. Garbage. $100+ for a box is a ripoff. Was looking forward to a Kyler Murray card. Assuming that his college football status is the reason he doesn’t have one? I remember Ricky Williams having minor league cards when he was at Texas. I’m guessing the rules around this have changed? Anyone know? Why is the #8 overall pick, Kyler Murray not in this set? He took a $4M+ signing bonus. He has made it clear that he is going to play baseball. Why would Topps NOT want to print a card for this guy? The #4 pick has about 17 different cards in this set. Murray is 5’8″ at best, and somehow listed at 195. He’s not going to be an NFL QB. Billy Beane is to smart to draft a guy this high w/o knowing if he’s committed. Can someone tell me why Michael Grove (Dodgers #2 pick) not included in set. Their #1 did not sign so I figure you need him in there? While I’m not exactly crazy about the design for the 2018 Bowman Draft Baseball Cards I will say the company isn’t cheating any buyer of this product with the configuration of both the Jumbo & Super Jumbo boxes/packs. The base configuration of the Hobby Jumbo Pack boxes are now selling for $99 which is very fair but I feel this price will be going up pretty soon. That is a lot of cards whichever route anyone decides to go in making a purchase. You just don’t get this amount of cards with just about every other card company regardless of sport & card type. Purchases a super jumbo box and was able to get a set of Bowman paper. Great hits on autos. Kelenic purple /250, Kelenic Class of 2018 /250, and Madrigal base auto. Got 131 of 200 Chrome out of the set with no dups. Lot of good high school prospects!! I always look forward to crack Bowman Draft. Anyone know why the only Joey Bart card is a box topper? Excellent product. And I was able to make a paper set from 1 jumbo box. The recommended viewing inserts are unnecessary. Not crazy bad, though. 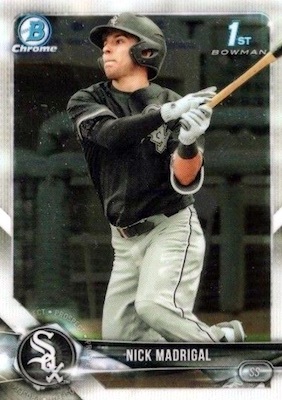 The Bowman Birthdays in 2018 Bowman Baseball has to be the worst imaginable insert…ever. Made 10 complete paper sets and 4 complete chrome sets (minus literally one card!) from a hobby jumbo case. Collation is amazing. One corner of a fairly rare auto was dinged out of the pack, but such is life. I purchased (preordered and paid in full) back in July 18 for $1250, so got an incredible deal from my LCS. Will definately be buying this again, for sure will pay in full in July this year. He was drafted in 2018 so this is Hoerner’s first Bowman/Topps autograph. It notes on the card that it’s first Bowman. He is also in Bowman’s Best. 2018 BOWMAN DRAFT CHROME JUMBO ASIA EDITION HOBBY BOX (1) BRAND NEW - VERY RARE!